CSI: Deadly Intent is the fifth game in the CSI Las Vegas series. It was developed by Telltale Games and published by Ubisoft. It was released for Windows on October 20, 2009, and on Xbox 360 and Wii on October 27, 2009. It is the third game in the series developed by Telltale, as the first two games in the series were developed by 369 Interactive. Like the other two Telltale CSI games, Deadly Intent was distributed traditionally through a publisher to stores. The CSI games remain the only Telltale games that were released through a traditional developer/publisher arrangement. CSI: Hard Evidence is not available to purchase digitally through Telltale's website, but it is available to purchase digitally online through GameFly. This game follows the formula of the other two Telltale CSI games, in that, even though this game was sold as a single product in stores, it still retains the episodic nature of Telltale's other games. 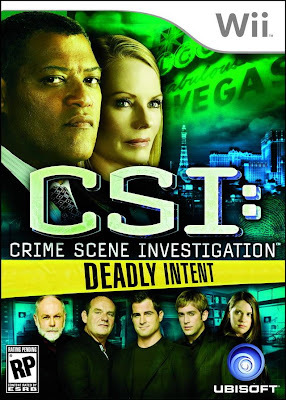 In this game, the player works with the new CSI team that was introduced in season 9 of the series, including Dr. Ray Langston, played by actor Laurence Fishburne.